Angel Falls: How To Get There? In our minds, getting to Angel Falls was not easy by any stretch of the imagination. Even though there was sufficient tourist infrastructure to make the falls accessible to nature lovers without breaking the bank or unreasonably risking our lives, we still had to spend a bit of effort, money, and time to finally lay our eyes on this most mysterious and mystical waterfall. 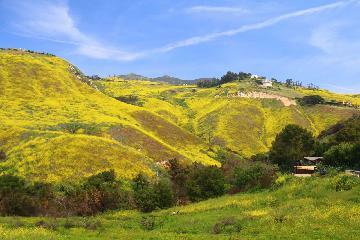 In this article, we’ll detail how we were able to pull it off on our visit back in November 2007. While this is just our personal experience (which may be different from yours), it at least gives you an idea of the logistics behind how we made it happen, and thus could be useful for trip planning in terms of how much time and money to allocate on a trip like this. 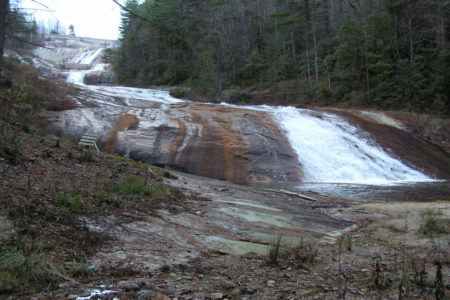 Where is Angel Falls and what does it take to get there? Angel Falls is nestled deep in the Gran Sabana Region of the Bolivar state of southeastern Venezuela. Since the falls was in a remote location, our visit involved a combination of flights (including small twin propeller planes) as well as a river journey. 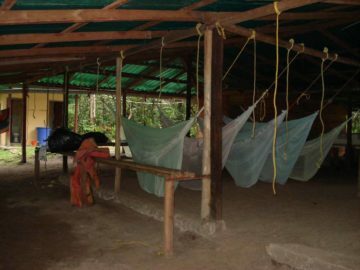 We also had to camp for several nights, which were equipped with hammocks, tables, as well as toilets all underneath tin-roof shelters. 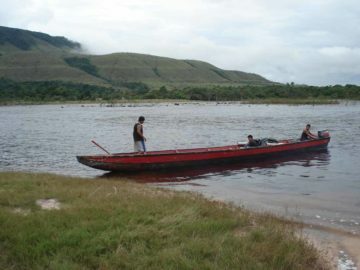 The key was to get to the indigenous village of Canaima. We managed to get there from Los Angeles (LAX) by flying roughly 5-6 hours to Miami (MIA), which was the American Airlines hub for flights to South America. Next, we took an international flight into Caracas, Venezuela (airport code CCS), where we took care of passport control and immigration before walking to a domestic terminal to catch the next domestic flight. We also used this time to exchange money into the local currency, which at the time was the bolivar (it turned out to be the very last year that this currency was used before switching to the bolivar fuerte). Then, we caught the domestic flight to Puerto Ordaz (there were also flights to Ciudad Bolívar). When we landed in Puerto Ordaz, we then spent the night at a nearby hotel. The next morning, we caught a local flight to Canaima via a small twin propeller plane. The flight culminated in a landing at a strip near the Canaima Lagoon, where we caught glimpses of attractive waterfalls spilling into the lagoon. 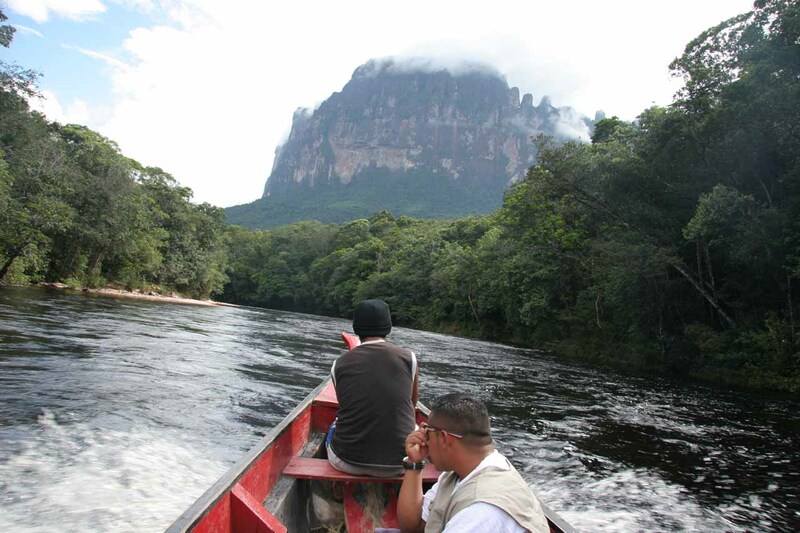 Once in Canaima, we were then transported by boat across the lagoon to our camp, which happened to be the Campamento Bernal. 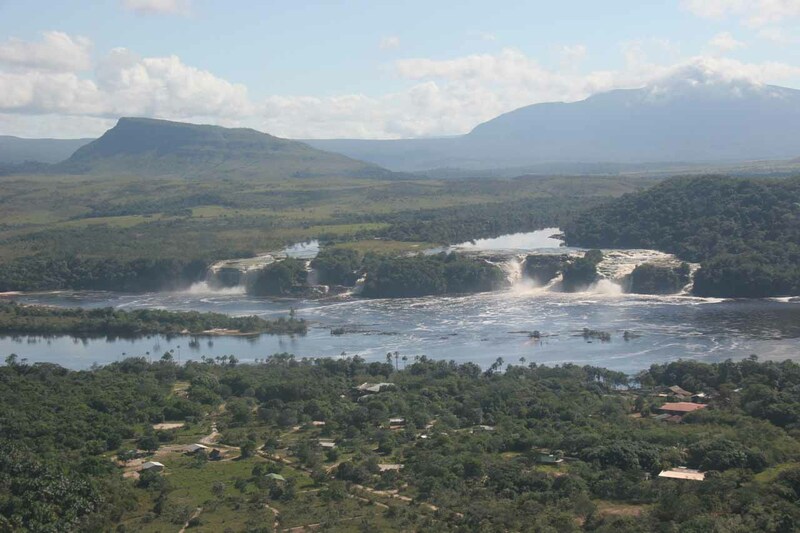 The camp was right across the lagoon from the waterfall Salto Hacha. This would be our camp for the next 4 nights (actually one of those nights were spent away from this camp). The next morning, we then took a long four-hour boat ride on a pair of rivers – Rio Carrao and Rio Churun. Bringing some kind of cushion or towel was a good idea because the seats were hard, and it was a lot of time spent in the sitting position. 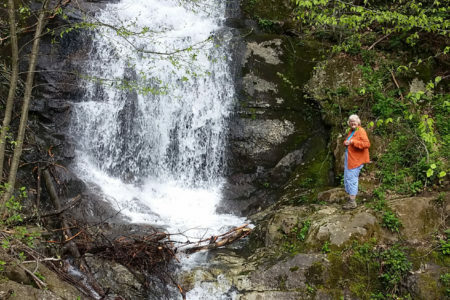 Eventually after arriving at the put out point, we then hiked an additional 60-90 minutes in a soggy, rooty, slippery, and steeply uphill jungle trail that began with a long (but fairly shallow) stream crossing before finally arriving at the lookout for Angel Falls. When we had our fill of the falls, we then hiked back to the boat, where we were then taken across the river to a remote camp. Again, this camp was also equipped with hammocks, mosquito nets, and a tin roof open-air shelter. The next morning, after having breakfast, the weather improved enough to allow us to take our last pictures of Angel Falls before we then took the boat downstream for about 2 hours back to the Campamento Bernal. After one more night spent in camp, we were then transported the next morning back across the lagoon to the village of Canaima, where we were then taken to the air strip for our flight to Ciudad Bolivar. On our return flight to Ciudad Bolivar, we were blessed with good enough weather to also have an overflight of Angel Falls for aerial photos. Eventually after arriving in Ciudad Bolivar, we then spent a final night there before being flown to Caracas and ultimately home the next day. Given the complex logistics, we actually pre-booked our visit with a tour operator prior to our arrival. So a lot of the logistics that I’m spelling out above (especially within Venezuela) were arranged by them. Only the domestic US flights and the international flights were arranged by ourselves. In addition to the logistical hurdles covering the transit between home and Angel Falls, we also had to be mindful about other logistical issues on both the political and health side of things. In the case of our November 2007 trip, we didn’t have a Visa requirement. In fact, I didn’t recall having to do anything special before arriving to the country. So all we needed was our passport, which must be valid for at least 6 months after our departure date from Venezuela. 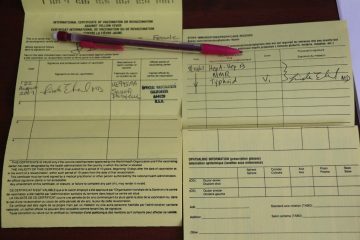 While I’ve read in the literature that we were supposed to possess a Tourist Card (DEX-2) or Tarjeta de Ingreso (said to be issued on the plane ride into Venezuela), I only recalled having to fill out a pair of forms not unlike the customs forms that was standard on international flights. That said, we did have to be mindful of having sufficient funds during our travels in the country to sustain ourselves as well as to leave the country at the conclusion of the trip. This included things like airport taxes, which we were charged for in every airport within the country. This tax was included in our international flight out of the country, but for domestic flights, we had to pay each time. As of our trip in November 2007, we were not subject to any vaccination requirements that would’ve denied us entry to Venezuela. However, we did bring our International Certification of Vaccination or ICV (a yellow booklet with records of all our recent vaccinations). We figured that it was always a good idea to bring this wherever we travel in which mosquito-born illnesses were a real threat. And in the case of Venezuela, mosquito-born diseases and water-born illnesses were no joke. We were actually vaccinated prior to our trip to Venezuela (even though the intent was to protect ourselves on a longer trip to Africa). Even though it wasn’t mandated on this visit, I always think of getting vaccinated as like our insurance policy protecting our long term health after the trip was done. We also generously applied mosquito repellent to further reduce our chances of an infected bite. The big caveat for vaccinations in our case was that most medical insurances did not cover them. We tended to get lots of mosquito bites (even though we generously apply DEET) so we didn’t want to take any chances. Thus, for our battery of injections and pills, we paid over $600 per person for boosters or vaccinations of Yellow Fever, Hepatitis A, Hepatitis B, Typhoid Fever, MMR (Measles, Mumps, and Rubella), and Malaria pills. We also had to keep in mind that Dengue Fever (definitely present in South America) didn’t have a preventative vaccine nor cure. So we had to be especially vigilant with minimizing our exposure to mosquitoes by applying DEET and wearing long sleeves (even though it was hot and humid there). 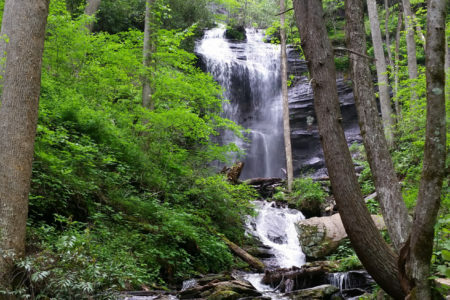 So how much time should you spend chasing Angel Falls? For the record, we were able to pull off our trip in a span of about 7 days. I’d say this was the bare minimum required for Angel Falls as well as some of the other attractions of the area like Salto El Sapo and the Canaima Lagoon Waterfalls. I also wished we could have extended our trip another few days to experience more of the Gran Sabana to experience other waterfalls like Salto Aponwao. I hope one of these days we’ll finally get a chance to do that. In any case, we took advantage of the Thanksgiving short week on this trip to minimize the number of days taken off.